Over the years, medical practices are noticing a big increase in competition. This forces practices to look for new and unique marketing strategies in order to remain successful. Much like any other business, a medical practice has to put their patients first and provide them with convenience and excellent care. An arising issue for many medical practices is finding a way to focus on patients and find time to market their practice and all they have to offer their patients. 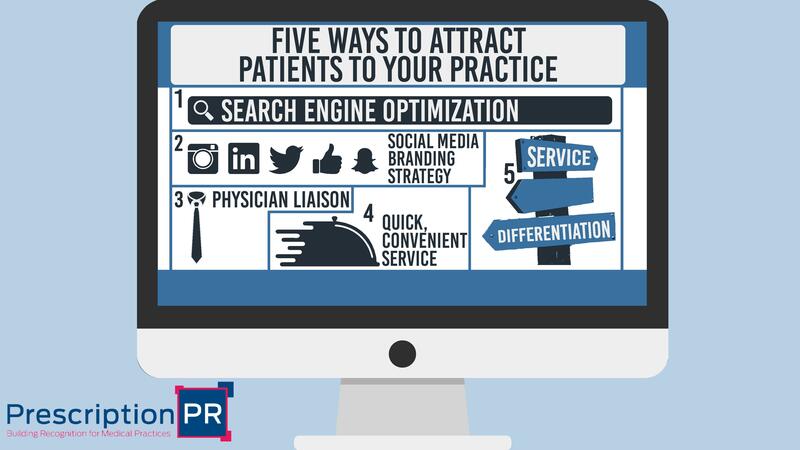 Prescription PR, a Long Island based healthcare marketing company, understands these struggles and has hands-on experience implementing successful tactics to increase the relationship between the patients and the practice! 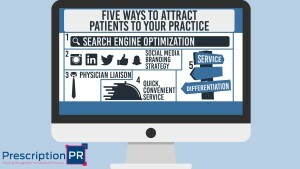 Below are 5 simple strategies that we have found success in attracting new patients to our clients’ practices. Much like shopping for any service or product, patients tend to “Google” a practice and view their website before choosing one practice over another. It allows them to get a feel for the office and doctors as well as see reviews. For this reason, it is essential to partake in internet marketing solutions such as SEO to ensure you rank highly on web searches. Statistics show that most people do not leave the first page of a Google search, so it is more important than ever to be one of the top 10 ranked sites for various searches. Social media is something all practices should be taking advantage of. It allows you to engage with your current and prospective patients on platforms they are already using. Pages like Facebook, =Twitter, and Instagram, as well as a few others, allow you to create a brand image and build ongoing relationships. A physician liaison will help introduce your practice to potential referral sources in your area. Building new relationships and growing relationships you already have are the best way to continually get additional MD referrals. In today’s fast-paced society, being simple and quick is essential. Doctors offices with a reputation for long wait times and slow service will deter patients from regularly scheduled appointments. This tends to be the biggest complaint seen on reputation websites like Yelp and Healthgrades. Focusing on accessible and efficient care will help mitigate any potential patient losses due to this issue. Have a cancellation? Call patients scheduled later in the day to see if they would like to come in early. When patients feel their time is valued, they are likely to refer you to a friend or family. In a competitive market, it’s essential to differentiate yourself. Whether your service differentiation is based on various factors such as being unique to the industry as whole or simply to the town you operate in, providing something different will keep a steady flow of new patient referrals. Invest in the latest technology and treatment options to provide further convenience for your patients such as next day lab results or same day appointments will add value to your practice. At Prescription PR, we are very familiar with the frequently evolving healthcare industry and are constantly finding new ways for practices to stand out. We offer an array of services to promote your practice to help get your practice recognized. Contact Prescription PR today and let’s begin increasing traffic in your office!